Access to clear, reliable, re-usable community resource directory data is not just important for people who are seeking services that meet their immediate needs — it’s also crucial for people who are seeking to understand the workings of the human service system as a whole, as they seek ways improve health and wellness for entire communities. Bread for the City — the primary community anchor institutions for the DC Open211 project — is already demonstrating the potential for resource data to spark systemic changes that tangibly improve the lives of their clients and the health of their community. 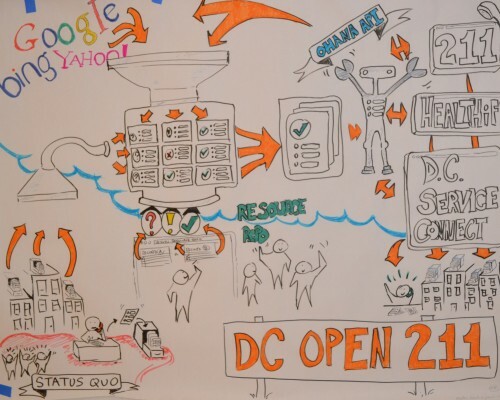 Over at Code for DC’s blog, the DC Open211 team reports back from the kickoff of the ‘Rebuilding Re-entry’ social lab. At this event, a number of groups explored the various challenges facing people who return from prison — and one of the most prominent themes was the difficulty of finding reliable information about services that can help them get back on their feet. Of all the resource directories produced in the DC metro area, participants even identified three that are produced specifically for formerly incarcerated people, each with their own strengths and weaknesses, yet all siloed!